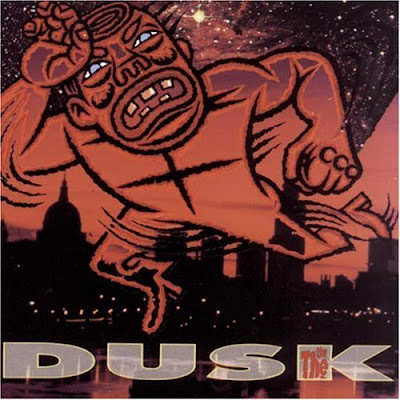 One of my favorite albums to come out in the 90's is The The's 1993 soulful masterpiece 'Dusk'. As many albums/bands/fads have come and gone since then (grunge rock anyone? ), this record out of place at the time holds up amazingly well as a true modern classic. During my college years I was a huge The The fan particularly 1984's 'Soul Mining' which is also a classic from them, (albeit more of a dancier record) and 'Dusk' which is a more mature mid-tempo guitar record that came out right around the time I was entering college. It featured Johnny Marr of The Smiths playing some of the most beautiful/subdued guitar work since his Smiths days, but really the mastermind behind The The is Matt Johnson. His vocals on this record have to be one of the most beautiful voices/lyrics ever recorded. Deep, rich and heartfelt. He wrote all the music and lyrics himself, but like other talented artists like Trent Reznor, he prefers to hide behind a band moniker. They've always been more of an underground Off the Radar type of band if you will, like another favorite of mine James. I think one of the main things that attracted me to The The's music growing up was Matt Johnson's introspective lyrics that were always questioning himself and how he fit into the world around him. A common theme that many teenagers probably go through like I did. The record features tons of different sounds and instruments (harmonica's, trumpets, hammond organs, tambourines, acoustic guitars) that give each track a slighly different sound and feel. The record kicks off with True Happinees this Way Lies with Matt Johnson pouring his heart out while a laugh track plays at the oddest times for a bizarre effect until it leads to him whispering and playing an acoustic guitar as the album slowly builds. Then the album kicks off with the second track Love is Stronger than Death. A beautiful ballad and homage about the power of love over even death. Then the record moves on to grittier/funkier tracks like Dogs of Lust and This is the Night to the gorgeous introspective Slow Emotion Replay were he questions himself with lyrics like 'Everybody knows what's going wrong with the world, I don't even know what's going on, in myself' and how he's 'just a slow emotion replay of somebody he used to be'. Gorgeous track with a great beatlesque type of harmonica and fast driving pace. My favorite of the bunch! Another great track is Sodium Light Baby. A love song were he declares 'You're the strangest feeling I ever had' and how 'we're all hostages to our hearts desires' and finally closing the album with Lonely Planet a song about overpopulation and changing our bad habits 'If you can't change the world, change yourself' with a genious twist in the last lyrics were he says 'If you can't change yourself, then change the world'. Pure brilliance! The entire 10 song album has to be heard in it's entirety to be fully appreciated. Try it out late night with some wine, smokes and maybe some good company. Here's a few tracks to stir your interest. If you like these I highly recommend you pick up the whole album. You won't be disappointed! Click here to check out their their video on youtube for Dogs of Lust with Johnny Marr playing the harmonica! yes one of the best of the 90s for sure. i got to see them on tour for that record. they were suporting Depeche Mode. i was stoked because Johnny Marr was touring with the band. but alas, his wife had a baby two days before the show here in miami and he left the tour. it was still a great show. im glad you brought this record back out!!! i remember that night. wanted to see Johnny Marr so bad. they were still great! also depeche mode touring for songs of faith and devotion w/david gahan at his drug peak. the first time i ever saw them play live, one of my favorite shows ever! tied with the daft punk show in miami. Sade also told us that love was stronger than pride.